• 3 Steps to Turn Your Stress Into Strength: Discover how to effortlessly release pent up emotions and how to become recharged with vibrant energy. Witness your transformation as you experience renewed enthusiasm, confidence and Joie De Vivre. • 3 Steps to Create Your Vision of Success: For those who feel frustrated in not getting what they want. They will discover how to clear their negative subconscious programming including their Belief system, which stop them from attracting the success they desire. • 3 Steps to Create Successful Communication: For those who feel hesitant in establishing rapport with potential clients, or personal relationships. They will discover how to stay centered and confident. They also will discover the magic of precision questions and how to align their language with their behavior to achieve a positive outcome. • Never Worry About Your Weight Again: Breakthrough strategies and techniques such as hypnosis to break free of emotional eating, create a healthy mental conditioning, gain self-esteem and achieve long-lasting results in maintaining your ideal weight. • Mindfulness Training: CEOs do it, Celebrities do it. They report personal transformation, a great sense of well-being, and happiness. Discover how to examine your 5 senses, connect to the present moment and experience a new mind-body connection. "We want to thank you for your presentation and dedication in giving the speech for the 15th Judicial Circuit of Florida. Everybody enjoyed it! It was great and very helpful." "When it comes to lifting the spirit and helping it soar, Edwige Gilbert is a meditation marvel.She helps clear the mind and focus energies so people are better able to attain their set goals. Edwige is truly inspirational. "I was always procrastinating about things in life for example school, work and things about my self. I would like to thank Edwige for helping me throughout my difficulties. With her help, I learned how to manage myself and now I am able to act without procrastinating. Thank you again. "My team and I had the pleasure of Edwige Gilbert’s presentation of “Turning Stress into Strength”. Edwige is captivating and delivers a workshop that is filled with insights and practical tools to work around stress.We walked away from the workshop feeling inspired and armed with actual means to help us navigate the busy New York life! Indeed, in a short amount of time, Edwige delivers on her promise to help you turn your stress into strength. I couldn’t recommend her more!. "A bell rings and we enter the life of the mind. We are lulled into a state of pure relaxation where nothing exists outside of us. We are gathered around in the West Conference Room and it is Thursday at 4 o’clock. We are listening to Edwige Gilbert, Wycliffe's meditation consultant...who offers us weekly mediation, as part of our fitness program here at Wycliffe, a gated community in Wellington Florida. This program runs once a week and its benefits are these: we are learning to relax, reduce stress, and to be “mindful.” According to medical experts meditation benefits people with or without acute medical illness or stress. People who meditate regularly have been shown to feel less anxiety and depression. They also report that they experience more enjoyment and appreciation of life and that their relationships with others are improved. "We would like to thank Edwige for her recent presentation at the Foshay Cancer Center. Edwige's approach to reducing stress and changing negatives behaviors and thinking is vital to our patients' recovery. She is positive and optimistic, and provided our patients with an enthusiam for change. Edwige is a living example of how her program can change people's lives. Our patients learned specific techniques through breathing exercises, and visualization allowing them to identify and change their negative thought patterns. The participants found the presentation very helpful, and proceeded to ask Edwige how they could continue this work. Edwige's program can be useful to those struggling with many of life's challenges. She is an excellent coach, who utilizes her care and compassion to help others. Thank you Edwige!" "Overwhelmingly, students recommend that we invite Edwige back so that more students may benefit from her lessons. Faculty and staff members concur with this recommendation. All in all, we would highly recommend Edwige to individuals, groups, or corporations who are looking for lives filled with, as Edwige would say, Joie de Vivre." "I was not sure how an office filled with a majority of attorneys would embrace Edwige's program on transforming stress into strength, but because of her unique style and breakthrough strategies, Edwige was able to capture everyone's attention and she was a great success"
"Through her affirmations and visualization techniques, Edwige has helped my real estate agents be more confident and successful." "Edwige Gilbert completely transformed our class offerings from Yoga to a full-fledged stress management program with waiting lists to attend. She got through to a diverse population of financial professionals. Our program is where it is today due to her hard work and dedication to her craft." "Due to her ongoing stress management program that includes four sessions of over 30 participants weekly, Edwige has been able to give our emotionally reluctant patients a range of valuable mind/body tools to assist them with their recovery." "Edwige transformed my ten sales representatives from an unmotivated and disconnected and lifeless group to a high performing, high-energy team. Your customized assertiveness training program improved our morale and our revenue goals." "Edwige Gilbert's story and ministry to others who want to exact change in their lives is incredibly inspiring. With her encouragement, my employees feel and believe that anything is possible and that their power comes from within. 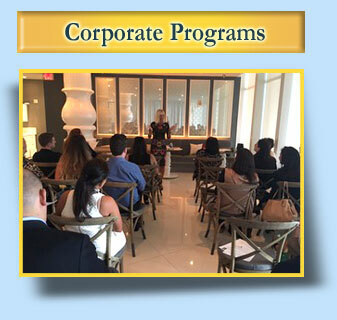 They have truly benefited from Edwige's instruction and gracious coaching, and continue to do so." "We have been very fortunate to have Edwige provide her "Turning Stress into Strength" presentation to the Program staff of the Alzheimer's Association Southeast Florida Chapter. In addition she has presented to several groups of caregivers and persons with memory loss. Her program not only is inspiring but she provides practical solutions to help make the transformation."